Another delicious addition to Gordon and MacPhail’s charmingly old fashioned Distillery Labels series. 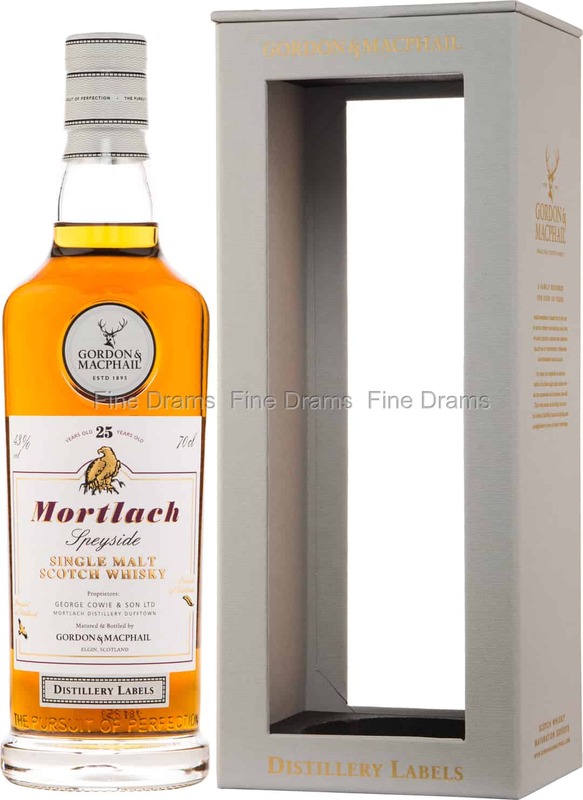 Mortlach is renowned for doing particularly well independently bottled, and such is the case with this bottling. Mortlach uses their unusual combination of different shaped stills to distill their spirit 2.81 times. The result is a thicker, more muscular spirit with an occasionally meaty quality. The maturation of this whisky has been expertly overseen by Gordon & MacPhail, one of the very best bottlers in the business. After 25 years of maturation, this dram serves up dignified oaky notes of old spice and wine tannins, with a little citrus rind, subtle tropical fruit, dried fruit, cooked apples, and a touch of mocha. A truly delicious dram, bottled at 43% and without colouration.